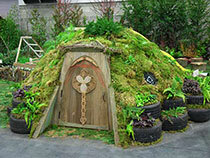 Decompose your lawn naturally, organically by sheet mulching. Sheet composting is the technique of laying organic material on top of the soil allowing it to decompose naturally as it does on the forest floor, activating the soil with healthy microbial life. Compost improves the soil structure allowing space between clay particles, suppresses weeds and aids in water retention. All of this means healthy, happy plants! Add to this an opaque layer of organic material (like newspaper or cardboard) that will smother the lawn and you will no longer need to dig it out, or worse; spray it with herbicide. Let’s keep that precious topsoil layer where it belongs and feed it with the nitrogen rich lawn it’s been supporting all these years. Give a final goodbye to your lawn by mowing it as low as possible. Determine what the new bed shape will be using a rope, hose or other materials on hand. Do yourself a favor at this point and dig out a small strip of lawn along the edge and flip it upside down onto the future bed so you have a clean line to begin with. Begin laying the newspapers, wetting them as you go so they don’t end up all over the neighborhood. Section by section, overlap the layers until you have spread all the newspapers about 10 sheets deep. 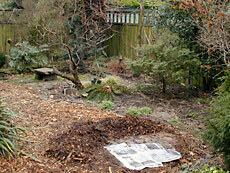 Next, begin to add organic material (topsoil blend, yard debris compost, wood chips from a shredder/chipper, leaf mould, etc) until you have at least 6” of material to cover the newspaper. Organic material has a funny habit of shrinking, so don’t skimp – the more the merrier: you’ll need more leaves than wood chips because it is a much finer material, whereas topsoil blend will shrink the least. That’s it! If it is the fall, sit by the fire and wait for things to decompose for planting in the spring. If you are ready in spring and prefer to do this procedure all in one step, it is better to plant directly into topsoil than finished compost. Dig a planting hole, cutting through the newspapers. Remove a chunk of that pesky lawn, turn it upside down and place in the bottom of the hole before setting in your plant. Consider planting potatoes or fava beans directly into the mulch as a seasonal strategy to cover the ground while breaking up the undisturbed soil. Allow the organic material time to break down as it smothers the lawn and improves your soil the natural way. Install your permanent plants in the fall after harvest.